The Dockmaster™ Bin Tipper was designed with a specific task in mind – safely tipping wheeled bins and drums from a raised loading dock. In many operations this is currently done by hand, which is difficult, slow and dangerous. The Dockmaster™ completes the process in seconds and is fully compliant with stringent new safety requirements. The Dockmaster™ is based on the proven design of the Simpro Dumpmaster™, but with unique features. The tipping mechanism inverts bins as low to the ground as possible, at just 27.5 inches (700 millimeters)*, while still keeping the weight within the footprint of the machine. To allow operating near platform edges, the Dockmaster™ is fitted with safety feet, just behind the wheels. These catch the machine if it is rolled over the edge, instantly preventing further movement. The Dockmaster™ is built to the same rugged specifications as the Dumpmaster™, including the steel frame, powerpack and control system. It will effortlessly tip most types of two-wheeled bins at weights up to 550 pounds (250 kilograms), and is designed to withstand many years of operation indoors or outdoors. Contact our sales team at 1.800.BHS.9500 to learn more about the Dockmaster™ or to locate a dealer near you. 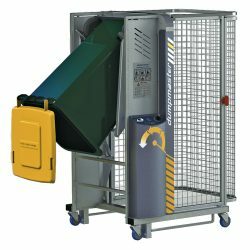 Improve staff productivity with an ergonomic Bin Tipper from BHS. On standard Dockmaster™ models the door is hinged on the left-hand side, but can be hinged on the right if specified at the time of ordering.